1936 Augustine & Kyer in its final days at 15th and Republican, jammed in with Walgreens’ 2000 building. We are awash in groceries! The recent headlines are amazing with the $43 million sale of Broadway Market, and Whole Foods with plans over on First Hill. Central Co-op and Cone & Steiner have set the tone for the high-end markets already but disposable income keeps moving into the neighborhood. The same was true in 1912. 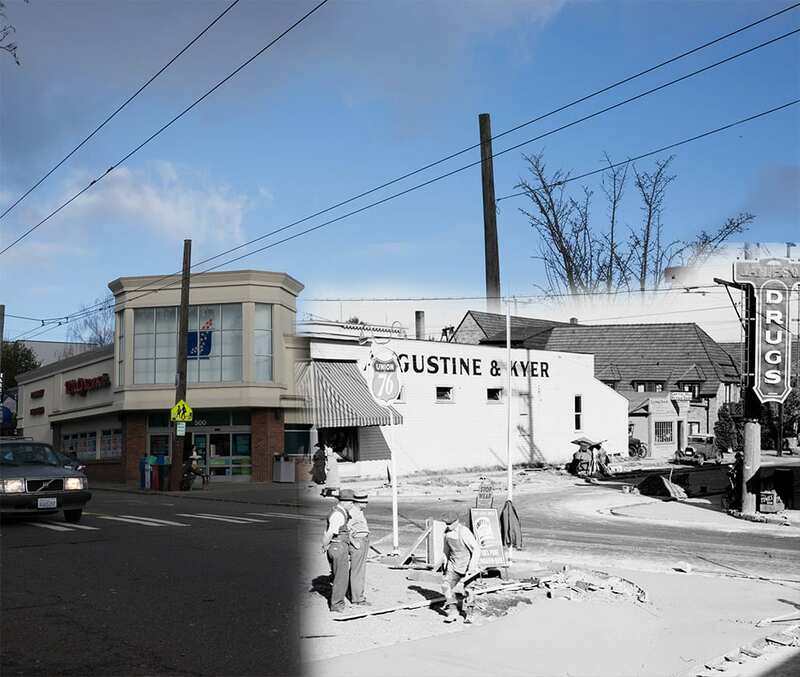 The prior few years brought easy access to downtown with regraded streets and new streetcar lines on Pike, Pine, Summit, 19th, and 23rd that filled empty lots with houses and apartment buildings. As in other parts of Seattle, grocery stores were small, independent businesses. 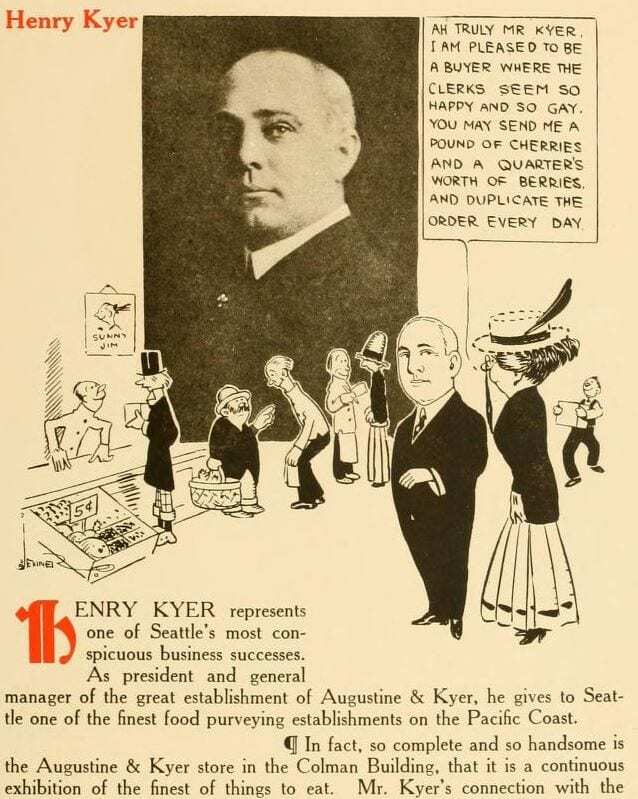 And then two branches of Augustine & Kyer — Seattle’s “Pure Food Purveyors” — upset the balance. Wealthy homeowners across the city had been phoning in delivery orders to A&K for years. The full-service grocer had 40,000 square feet in the Colman building at 1st and Marion, 19 operators with dedicated phone lines to take orders, and a fleet of 18 horse-pulled delivery wagons to distribute them around town. In 1909 A&K opened a store in Queen Anne to directly serve customers. Then as the rich continued to move into James A. Moore’s original Capitol Hill development, Broadway, North Broadway, Roanoke Park, Summit and the other neighborhoods that we now call Capitol Hill, A&K opened two additional stores in 1912. The North Broadway store was at 10th and Miller where Pagliacci’s North Capitol Hill branch is today. And our subject, the Capitol Hill store, was at 15th and Republican, now a Walgreens branch. The chain started in about 1880 when Charles Louch opened a grocery store on 1st Avenue. A decade later he was joined by Manuel Brock Augustine, formerly a salesman for San Francisco’s Folger Coffee. Louch & Augustine grew and formed a distribution arm, but Charles Louch returned to his native England in 1903 and sold his share of the business. In 1908 M. B. Augustine turned over control of the business to his son Julius Augustine and his son-in-law Henry Anderson Kyer. For three decades the business operated under their names, Augustine & Kyer. The Augustines and Kyers moved their homes quite a bit in the 1890s, renting a series of houses that led them to First Hill. From 1900 on they were Broadway residents and then in 1905 M. B. and wife moved to the new Capitol Hill neighborhood at 16th and Prospect while son Julius moved to Roanoke Park in 1910. Henry Kyer and his wife Alice (nee Augustine) lived at Harvard and Mercer until their 1907 divorce. 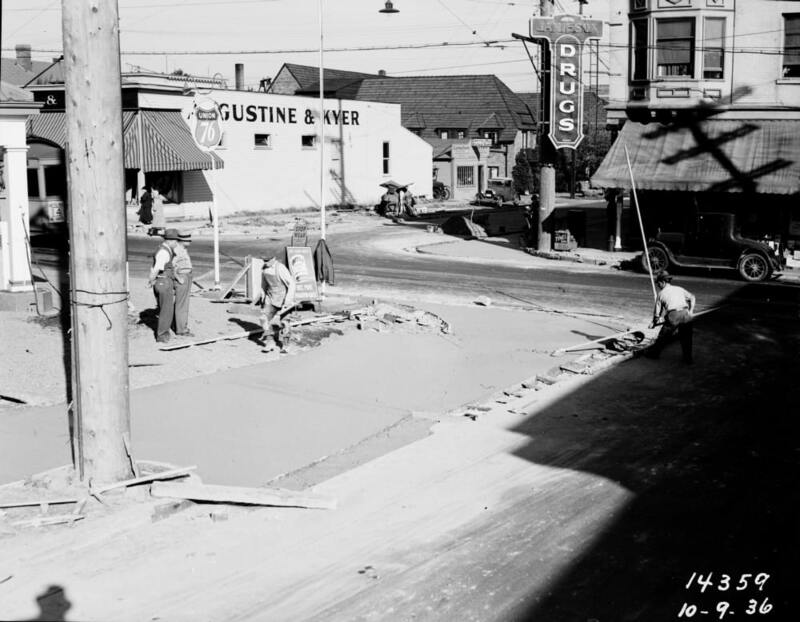 It’s amazing that the Augustines personally lived out the gradual drift of Seattle’s wealthy away from downtown through First Hill to new neighborhoods. When they opened stores in North Broadway and Capitol Hill they knew firsthand about the new lives of their clientele. The North Broadway store only lasted 5 or 6 years, closing during World War One. But the Capitol Hill store lasted deep into the Great Depression, closing in 1937 as A&K sank into debt. Eventually distributor Pacific Fruit took possession of A&K. In 1939 M. L. Bean was hired by Pacific Fruit’s parent Pacific Gamble Robinson to save a number of Seattle groceries. He immediately gave up on A&K, selling off the remaining assets of the chain. Finding product advertisements is probably the funnest thing about searching for Louch & Augustine and Augustine & Kyer in digitized, old newspapers. The product line in the 1890s in particular is fascinating. For example, imported Dutch cheese and German pickles. In farm magazines, they advertised the sale of spare cows from their dairy. One L&A specialty was their 1888 Brand Ham which they smoked on site. Also, the L&A candy department grew into an A&K factory that outlasted the grocery store into the 1950s. 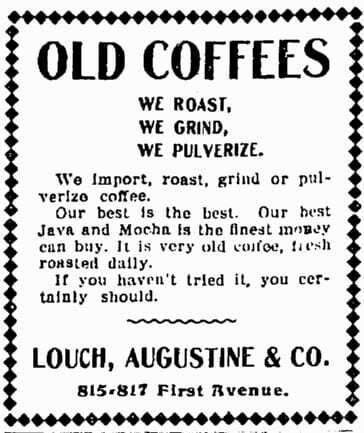 Because of M. B. Augustine’s Folger Coffee background, coffee was a store specialty from the Louch & Augustine days right up to the end of the business. Some of the terminology was different, and it must have tasted quite different to drink, but ads made the same boasts that Starbucks makes for its new Reserve roastery. “Old coffee” in the 1890s was a shorter way of saying old crop coffee — stuff that wasn’t the latest off the bush. But it usually referred to acidic coffee that had been “mellowed” by aging it. Epicures (1890s foodies) would age it in the hull of a ship for humidity and presumably to match the centuries-old salty taste of slow sail-shipped beans. “Pulverizing” referred to a very finely ground coffee. It was too fine for a filter or percolator, instead matching the standard way of preparing coffee back then: boiling the grounds in a pan. We call that process cowboy coffee these days, and it seems to be slowly picking up steam with backpackers and other folks roughing it in the outdoors. Back to the Starbucks comparison. Starbucks Reserve has a Sumatra blend aged for five years. L&A was focused on beans from Mocha (the Yemeni port of origin for the worldwide coffee trade) and Dutch Java. Meanwhile Starbucks, Caffe Vita, Stumptown and other modern chains turn to a much wider array of sources. Mocha is off the list for all of them, because of the US trade embargo on Yemen since 2012. Last year I wrote up a history of Augustine & Kyer and Charles Louch’s farm as part of a continued exploration of the origins of Tradewell stores. Don’t miss the City Market Re:Take as well, discussion of a former Tradewell. This entry was posted in News, etc. and tagged 15th Ave, history, retake by Robert Ketcherside. Bookmark the permalink. What a great little history lesson! Thanks much. I love looking at the old advertisements too. Thank you! Recently the 1870s to 1890s Seattle PI were posted to the Library of Congress’ Chronicling America site. The ads are amazing. Every store or building that open on Capitol Hill in the next five years should rip off a Victorian ad. Your articles are great, Robert. Thanks so much! Thanks! Changes in word use can be confusing and awkward. It took me a day of web searches and reading contemporary material before I felt confident that I knew what “old coffee” meant. If you search for uses today, it’s all people asking if drinking day-old coffee will make you sick! Thanks for a nice Sunday morning read. I remember the controversy when City Peoples closed for Walgreens. I don’t go in often but still feel guilty when I do. This page has old assessor photos just after A&K was replaced by Big Bear market, and later on its March toward Walgreens. One of the hidden revelations of this post is that the now-hideous ShopRite building once had attractive bay windows, before some mid-century cheapskate tore them out and stuccoed over the holes. Very nice job of research on my family’s business!! This business was started by my Great Great Grandfather five generations ago. Your information is accurate and well researched. I was told by my grandfather that the 1888 Hams & Bacon were famous in Seattle for their flavor and quality. I have several photographs of horse drawn carriages lined up at the flagship Augustine & Kyer location in downtown Seattle at the Coleman Building on 1st Avenue. I also a framed artist rendering of a postcard of the interior of the store on 1st Avenue. Thank you again for sharing such a well written and researched article! I really appreciate the reaffirmation. I’m so glad that someone from the family read this and enjoyed it. I always look forward to these then-and-now articles – thanks so much! Really hate the aesthetic of 15th as a whole, unfortunately. Really great-looking blocks (Fire Station 7, Victrola, Canterbury/Olympia Pizza, Smith/Starbucks) are surrounded on all sides by the worst of the 90s car-oriented architecture (Safeway, QFC, Walgreens, the Subway building, Key Bank, etc.). The “worst of 15th” buildings above are some of the few in Seattle that I *wish* would be replaced by Pike/Pine style holes in the ground and then eventually by modern mixed-use businesses and apartments. Would really improve the look of 15th as a whole. While I detest the Key Bank building and parking lot, I love walking in and seeing the bank of unused teller windows. It takes me back to the days before computers when we needed dozens of tellers to reconcile banking transactions. And the smell, I just love it…. But its days have certainly come and gone. I’m sure its only a matter of time before its leveled for something much more diverse. Agreed with the other poster, its a shame to see how the ShopRite building has been stripped. I love 15th and am adjacent to it for the long haul. I can’t wait to see it evolve…. I see the 15th glass “half-full” instead of “half-empty.” Overall, I think it’s a very nice, smaller-scale street, with a variety of interesting businesses. I agree that the Key Bank building should go, especially since it seems underused, but I think QFC, Safeway, and Walgreen’s are here to stay. A neighborhood needs a drugstore and supermarkets, and the latter must have some parking in order to be commercially viable. Agreed that those are useful businesses, I shop there all the time. The fact remains that if they were built *today*, they’d be more like the Safeway on 23rd, Trader Joes, Harvard Market QFC, etc. (but hopefully with better architecture!). Underground parking, retail space on 15th rather than blank walls, 3-5 stories, etc.